Kleefeld on Comics: How Do The FF Pay For All That Stuff? Here's an old piece I wrote for my now-defunct FFPlaza web site, looking at how the Fantastic Four are able to pay for all the whiz-bang toys they have. As all the things that I wrote for that site, it's a few years out of date now, but the basic premise and the histories in it are solid. The Fantatsic Four have spent years protecting the Earth from all sorts of disasters, often with the help of one of Reed's inventions. But where does he get those cool toys? Sure, Reed has the intelligence to design and build them himself, but you can't build a transpatial breach detector from stuff you found in a junk yard! It requires a lot of money. But where does all that money come from? Nathaniel Richards, Reed's father, was a genius. He amassed a small fortune during his early career as an engineer, designing creative new inventions for large corporations. He bought a house in California while sending Reed off to several colleges and universities. During Reed's schooling Nathaniel invented a time-machine. It remained untested until he could set up a self-perpetuating trust fund for his house's "landlords" (Mr. and Mrs. Peacock) in the event that he was either killed or could not return. He also left two billion dollars for Reed to finish school and get his start in life comfortably. After Nathaniel's disappearance (and presumed death) Reed did finish school and began working on a government-funded project to build a rocketship. It was during this time that the alien Gormuu tried to conquer Earth and convinced Reed to work even harder on the project. Unfortunately, that also convinced the U.S. government that more money should be funnelled into weapons research and Reed's project was cancelled. Reed continued on the project, using the remains of his father's inheritence for funding. It was only after Reed's financial resources were all but depleted that the Fanatstic Four tested the still-unshielded Pocket Rocket. Upon receiving their awesome powers, the Fantastic Four used the remains of Reed's money to leave for New York to set up in the Baxter Building. Reed used most of it buying the rights to the top five floors. At this time, Reed also tried to earn more money by playing the stock market until a market crash sent them deep into debt. The quartet had to live almost solely on credit and soon had to resell the floors back (Fantastic Four #9). They continued renting until the Sub-Mariner approached them with a movie deal. The FF had enjoyed success as super-heroes/celebrities and their film did relatively well because of that. Their royalities primarily allowed them to pay off their creditors, but it also gave Reed the idea to incorporate the group legally. 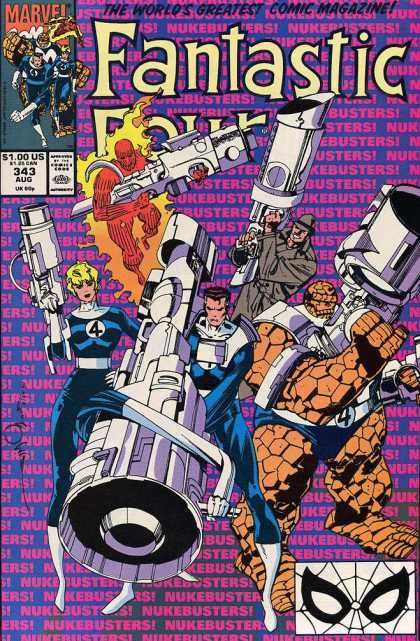 Although Johnny, Sue and Ben each own equal portions of the Fantastic Four, Inc., Reed himself owns 51% of the stock and subsequently always has the final say in the group's endeavours. He then designated that the royalties from all his future patents be directed to the group instead of himself. This is perhaps Reed's greatest stroke of financial genius. Many of his inventions have been revolutionary and their effects have been felt world-wide. Much of the technology he has invented was quickly incorporated by super-powered beings. The most notable is probably unstable molecules. Their instability allows them to be incredibly resilient to drastic changes in heat, cold, pressure, density, etc. making them ideal for superhero uniforms. Nearly every Marvel Universe hero and villain has a suit made of Reed's unstable molecules giving the FF a somewhat more regular income. The group continued to have an ever-increasing amount of debt and Reed was eventually forced to sell his shares to Interlocking Technologies, Inc., run by Mr. DeVoor. (Fantastic Four #160) Although DeVoor was merely a pawn working in conjunction with Arkon to instigate an inter-dimensional war, their plot was foiled and Reed bought back his shares of Fantastic Four, Inc. at a substantial loss to Interlocking Technologies, which was soon after dissolved. The Fantastic Four continued to lease the top floors of the Baxter Building. Reed was able to make some modifications to the building structure, but was obviously limited by the owners and landlord. Exercising a clause in their contract, Reed used much of the money saved up from his patents to buy the building outright in FF #244. This gave the group a greater monthly income since other tenants now began paying them rent. The team was able to live quite comfortably for some time. One of the biggest monetary travesties since the FF's incorporation was the destruction of the Baxter Building. (Fantastic Four#278) Although it was undoubtably insured, Reed's designs for Four Freedoms Plaza were considerably more costly than what the insurance company would pay out for their previous headquarters. Given their financial status, however, construction of the incredibly expensive building went smoothly. It was not until the top half of Four Freedoms Plaza was destroyed during the Infinity War that the FF truly felt the repercussions of their new headquarters' expense. Reconstruction was delayed considerably until the team could regain some of their assets. A decided benefit, though, was that Uatu had "borrowed" nearly all of their equipment during the Baxter Building's destruction and returned it shortly after Four Freedoms Plaza opened, thus saving Reed from having to reconstruct those items as well. In Fantastic Four #371, Johnny accidentally destroyed a significant portion of the Empire State University campus. In order to avoid a multi-million dollar lawsuit, the FF agreed to build an athletic center and a science laboratory for the school. While a sizeable amount of money in itself, part of the agreement also stipulated that Reed's scientific patents be turned over to the school. The sudden lack of income, coupled with the funding of building construction, nearly sent the team into bankruptcy. Much of their equipment was sold off and they were in financial dire straits until Reed was able to obtain patents on his newly created inventions. Although it has never been expressly stated, Reed has probably bought back several of the more important patents (unstable molecules, Fantasticar, and Time-Sleds for example). After the FF's return from the Franklinverse, the Fantastic Four found that most of their equipment was missing (Reed's father had hidden it in the Negative Zone) and their headquarters had been given to the Thunderbolts. While their water-front warehouse was returned to them, they still found themselves in a financially tight situation. While waiting for his patents' stipends to be returned to the Fantastic Four, Reed took up a professorship at Empire State University. This gave him access to a great deal more equipment, although he stopped using it once he had set up Pier 4 as their new headquarters. For the record, below is a partial listing of Reed's inventions and discoveries that have been expressly mentioned or shown in the comics. While it is unclear which have and have not been patented, it can be assumed that Reed has at least applied for patents on all of these items.